Child abuse is a term that is used in various manners, particularly in the realm of law, to describe the unjust treatment of children by their immediate guardians, whether it be parents or legal guardians. Typically speaking, most will correlate child abuse to being a physical implementation, where an abused child is beaten and harmed in a physical manner. However, the term child abuse also includes any kind of emotional abuse and sexual abuse. Furthermore, an abused child does not have to necessarily be harmed in a direct manner, for child abuse will also include omission as part of its definition. This refers to child neglect, which is considered to be a form of child abuse under the law. An example of child abuse involving neglect could be not providing for proper sanitary living conditions at the home or even neglecting to feed and take proper care of the child. In the United States, child abuse is divided into four categories: Neglect, physical abuse, psychological abuse, and sexual abuse. Neglect simply means not providing for the proper and necessary care for a child. 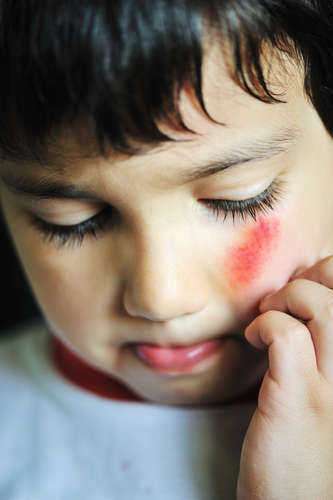 Physical abuse is any kind of physical harm that is inflicted on the child. Psychological abuse, also known as emotional abuse, refers to any situation in which the child's emotional or mental health are affected, such as constant and repeated insults. Sexual abuse is when a parent or guardian engages in sexual advances or situations with a child. This kind of child abuse extends beyond parents or guardians and can also include other family members as well.